Initiated by the Dalhousie Transportation Collaboratory (DalTRAC), the campaign is the product of extensive research and community consultation. After a review of more than 70 Share the Road campaigns from North America, New Zealand and Australia, DalTRAC and interested communities hosted several community engagement sessions (in Chester, Hubbards, New Glasgow, Pictou, Halifax Regional Municipality and Annapolis County) to generate discussion on sharing the road in both urban and rural contexts, and ideas for what a local Share the Road campaign should look like. Information from the community workshops was used to design a Share the Road awareness campaign for Nova Scotia, which can be adopted by any municipality. Beyond the borders of Nova Scotia, the campaign has also sparked the interest of areas in Ontario and Saudi Arabia. We have collaborated with teams in Oxford County and Jeddah to take our positive message even further! 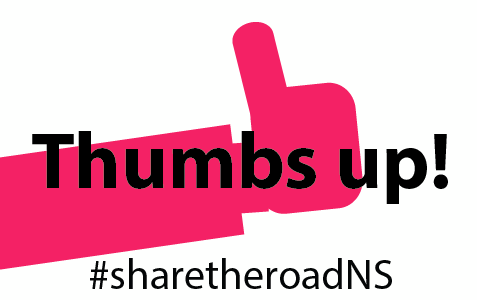 For information on bringing Share the Road Nova Scotia to your community, Contact Us.